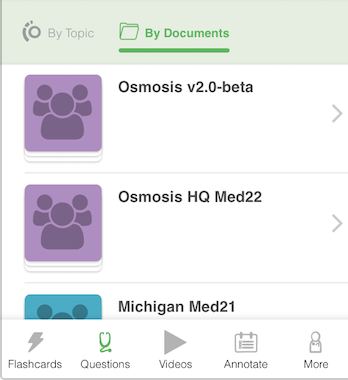 The flashcard and question queue on/pushed to your mobile device(s) will be determined by the flashcards and questions available in your "Primary Workspace". Your Primary Workspace can either be a Team Workspace, or a Private Workspace - whichever you use most often to create and study flashcards and questions. You can choose which Workspace is your Primary Workspace by clicking on the Private Workspace or Team Workspace Tool, and choosing your preference. Find the workspace you’re looking for, and select the week(s) of material you want to review based on flashcards that are linked to documents. You can’t see the slides on mobile yet, that's a feature we’d like to develop. 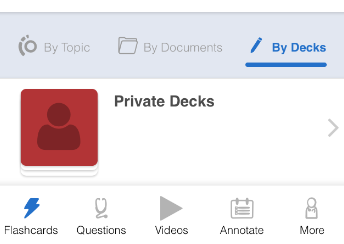 Find the workspace you’re looking for and select the name of the independent deck (not linked to documents) to quiz from.